Part 1 suggested the macro force of “peak oil” which will constrain global oil supplies, will push the price of oil higher. Yet if peak oil occurs, it implies peak debt and GDP. Without GDP growth, a stagnant economy implies downward pressure on the price of oil. In part 2 I look at which factor is more dominant in moving the price of oil, which country looks favourable in such an environment and where I believe the most opportunities lay in terms of oil stocks. Canadian oil stocks are one of the best places for investors. Canadian oil stocks benefit from rising oil prices, and the global supply constraints of “peak oil” should push oil prices higher. In spite of the potential for peak oil production, which would stunt global growth, there will be strong demand for oil for the next couple decades. This is good for Canada as its oil production is increasing, while global oil production has already levelled off. Canada has relative strength in oil compared to the rest of the world, and this means opportunities for investors in the Canadian oil sector. Global oil production levelled off in 2005, as OPEC levelled off. Non-OPEC production had actually flat lined at least a few years before this. While OPEC claims to have spare capacity there is little evidence in the way of their actions to support this. Even as the price of oil screamed higher in 2007 OPEC production barely budged. European production has been declining since 2001, Mexican production since 2004. No more giant fields are being discovered. Couple this with rising demand in China, India and emerging markets and a long-run strain on production is inevitable. Add to this that most countries around the globe are consuming more of their own production. This basically means that exporting countries or regions are exporting less as their own demand for oil rises. 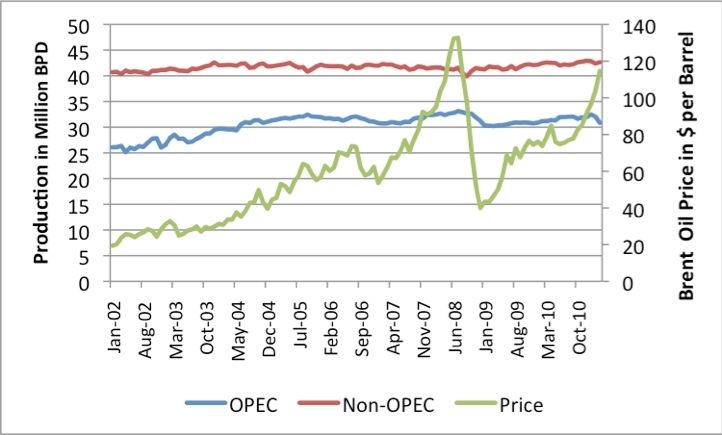 Figure 3 shows OPEC as well as non-OPEC production flat lining. Source: http://www.theoildrum.com/node/8268. Figures based on EIA data. The levelling off and eventual decline in global oil production should outweigh opposing factors in pushing the price of oil higher. Even in economic contraction oil consumptions drops very little. This means demand keeps up while production wanes. The long-term impact is steadily higher oil prices in the years to come. 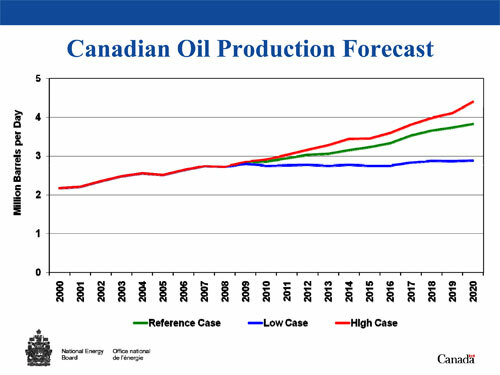 While global oil production is sagging (good for pushing oil prices higher), Canadian oil production has been rising and is expected to continue to rise, or in the worst case level off, according to the National Energy Board of Canada as shown in Figure 4. How Does This Help Canada? Canada has a lower debt level than many other countries. This means there is room for growth. Canada has money, debt availability and resources to invest in projects which are profitable – one of these is the Canadian oil sector. Countries such as the US on the other hand are facing a peak debt scenario (as discussed in part 1) and are unlikely to be able to generate sustainable growth for some time. Canada is much farther away from peak debt, indicating a decade or more before the Canadian economy plateaus. The Canadian economy will not plateau until Canadian oil production declines, which is not forecast to happen any time soon. Global peak oil production will dampen economic growth and eventually lead to a global economic decline. Canada is insulated from this; as Canadian oil production increases and sells at a higher price, Canadian GDP is likely to rise while many countries face economic declines. An increase in Canadian oil production means Canadian companies sell more oil, which is good for GDP and stock returns. That attracts investors. A global decline in oil production indicates a supply constraint, which means Canadian companies sell more oil at a higher price (higher margins). It comes down to simple math—if Canadian companies can produce more oil and sell it at a higher price, Canadian oil stocks are likely to outperform in good and even poor global economic conditions. Again, this shows relative strength, which is where investors want to be. Rising Canadian oil production draws investors not only from Canada but also from outside. The transparent and developed oil market attracts liquidity from around the globe. Canada is also a friendly place for new start ups, which means more opportunities arise as companies push to tap more and more of the Canadian oil reserves – currently third largest in the world according to the CIA. After determining Canada has relative strength globally in oil, making it one of the best places to invest, investors should look at which oil stocks are showing relative strength – a phenomenon discussed in a prior OGIB article, Oil Stocks & Relative Strength: What to Look For. This can be summed up as buying strong stocks which are holding up very well in a weak market, and move aggressively higher in strong markets. This doesn’t mean plunging headlong into every Canadian stock. Potential global supply constraints will continue to create volatility, which means buying companies that hold up well in tough economic situations is essential. While the stock has had a wide range (on a percentage basis), the stock held above January and February levels even as the overall TSX plunged below its January and February levels – in other words CEU held up well in a tough economic environment. Since early October, oil and the stock market have crept higher, while CEU has exploded to near all time highs – the TSX Composite remains negative for the year, while oil is close to break-even. 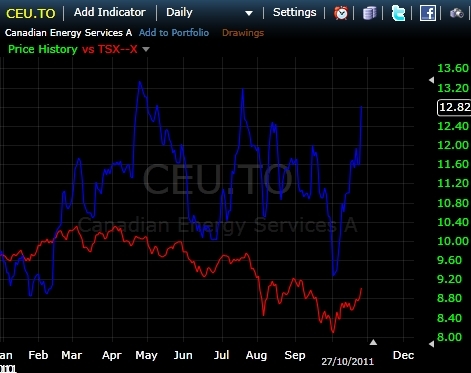 Figure 7 shows CEU.TO (blue) compared to the TSX Composite (red). The chart shows that even during tough times for the economy, there are excellent opportunities. As stock markets and economies decline, looking within the Canadian energy space for stocks which form a base and hold at or above support levels will provide the best opportunities. These same stocks that show strength in overall market weakness usually exhibit outperformance type strength when the overall market is flat or moving higher. Canada increasing oil production while the rest of the world declines means more demand for Canadian oil, pushing Canadian oil stocks and GDP higher. That show Canada’s oil market has relative strength to the rest of the world. Declining global oil production pushes the price of oil higher, which means Canadian companies producing oil can sell at a higher price, increasing margins (good for stocks). Debt levels in Canada are low relative to many other countries. Unlike debt constrained nations which face limited growth prospects, Canada is not likely to face a long-term decline in the economy until its oil production begins to decline, which is not currently forecast. The Canadian market attracts liquidity from around the globe. The market is transparent and the potential for relative outperformance and the strong Canadian dollar are likely to continue to attract investors. Patience is still required when making trades, but Canada stacks up well whether the global economy does well or poorly. If anything, the clash of these giant macro forces will create amazing opportunities in the sector, due to the volatility that is created.